This week’s recipe combines three different recipes to create one delicious breakfast treat, perfect for any Sunday morning. Seize the opportunity to learn how to create your own home-made buttermilk biscuits, a delightfully easy mushroom hollandaise sauce, and poached eggs. 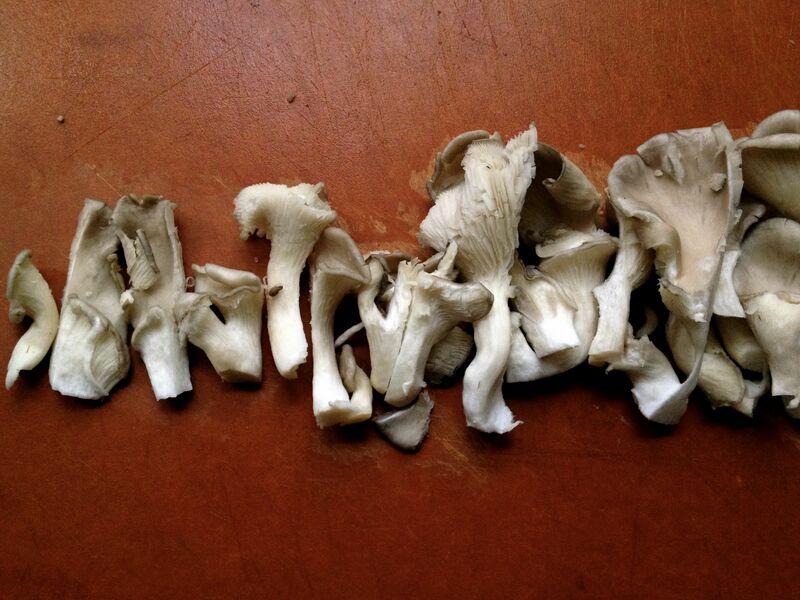 Stop by the market this week to pick up some fresh oyster mushrooms from Far West Fungi, a lemon or two from Twin Girls Farm, and some delicious cage-free organic eggs from Great Valley Poultry to delve into morning creativity! Recipe to follow after the jump! 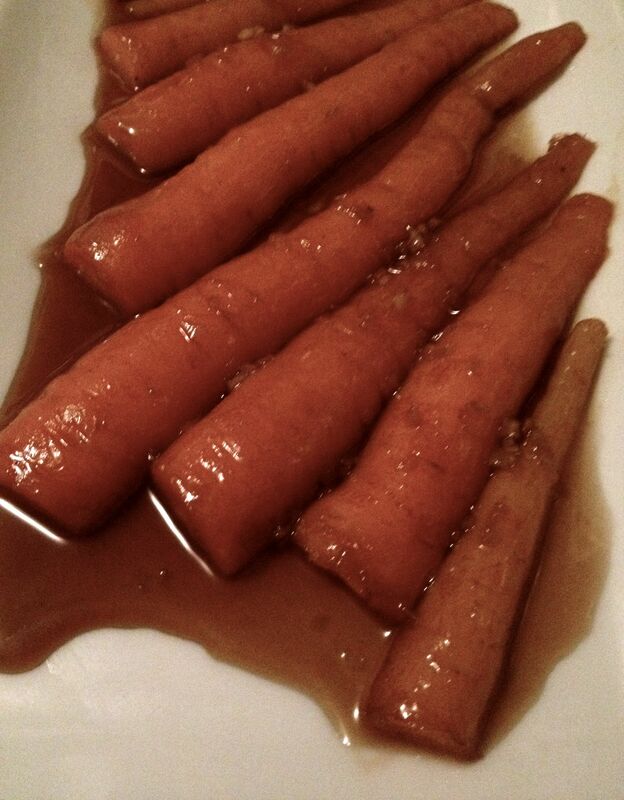 If you’re looking for a sweet but healthy snack, try glazing your carrots in some brown sugar, ginger, and garlic! This dish is delightfully full of flavor and satisfies your sweet tooth without the processed sugar conventional candy contains. Adapting your palate to craving healthier sweets can start with a visit to the Blue House Farm stand at this week’s market. They grow an array of organic vegetables, cut flowers, and fruits year-round on a beautiful farm tucked into the valley of Pescadero, California. 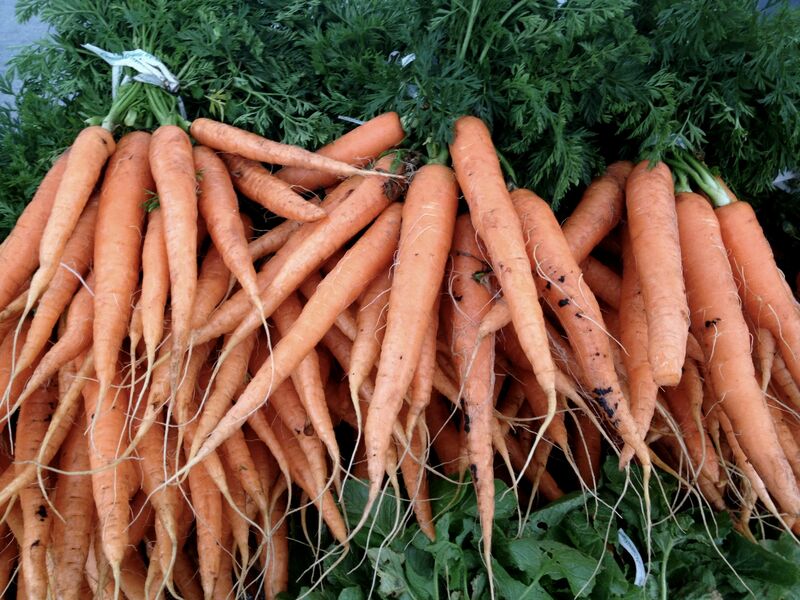 Grab a bunch of carrots from the market, and add in some garlic, organic dark brown sugar, organic sweet butter and ginger from Rainbow Grocery or your local market to make this easy, delectable dish at home! 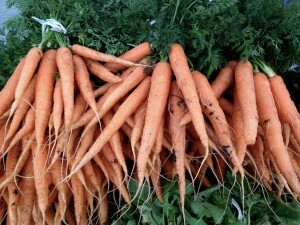 Slice carrots in half after a good wash to get all of the moist soil off of their skin. Blanch sliced carrots for roughly 6 minutes until they embody their true orange hue. In the meantime, melt butter in a separate pan. Add minced garlic and ginger when melted and simmer on low. Add brown sugar once the garlic and ginger have infused with the butter and add a dash of water. Strain carrots and add them into the brown sugar sauce and simmer until carrots turn slightly gold with sweetness. Serve alone or accompany with a side dish of coriander rice. This week’s recipe is the perfect representation of the change in seasons from winter to spring that we see here in San Francisco. It’s incredibly light and gentle on the palate, balancing a blend of Mission Community Market’s sweet and savory offerings. 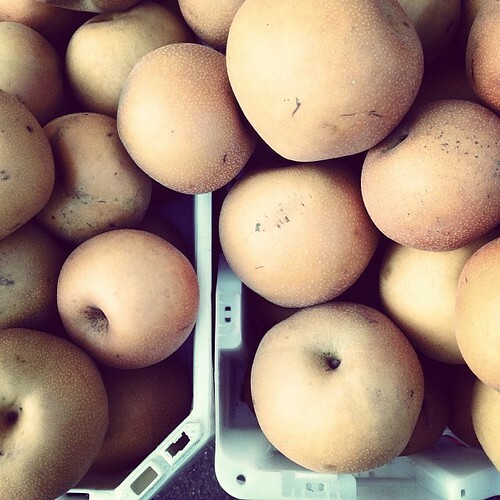 Stop by K&J Orchards this week to try their mouthwatering asian pears! The subtle sweetness of the fruit expands into a powerful flavor with each bite. This family-owned farm lies north of San Francisco in Winters, CA and produce a variety of tree fruits throughout the season. Next, walk just a few stalls up 22nd street and visit Achadinha Cheese Company’s stall. to try their wide variety of goat cheeses. Their enthusiastic salesperson Chris will intrigue you with all the creative combinations you can think of (and some you may never have thought of)! Fresh Feta from Achadinha Cheese Co.
Add a teaspoon of butter to a pot and melt. Add 1 whole chopped asian pear and half of the asparagus with a light sprinkle of coriander. On low heat, lightly brown the pears and asparagus. Add 1 cup arborio rice with 1 1/2 cups water or broth into the pot. Bring to a boil and reduce heat. In a separate pot, heat 2 1/2 cups of water or broth. Throughout the duration of the rice cooking, periodically stir well. Halfway through cooking add the rest of the julienned asparagus. Once the liquid is absorbed, begin to add the hot water/broth (1 cup at a time). Cook and stir after each addition until the liquid is fully absorbed before adding another cup. Simultaneously in a separate dry pan (without any oil) brown the walnuts. In another pan, add oil and chopped shiitakes. Cook on low heat. Towards the end, add less than 1 tablespoon each of honey and balsamic vinegar. Stir well. At culmination, add 2 tablespoons of water and let the shiitakes sit in the warm pan until dinner is served. Once risotto is almost complete, add a little bit of the brine from the feta container. 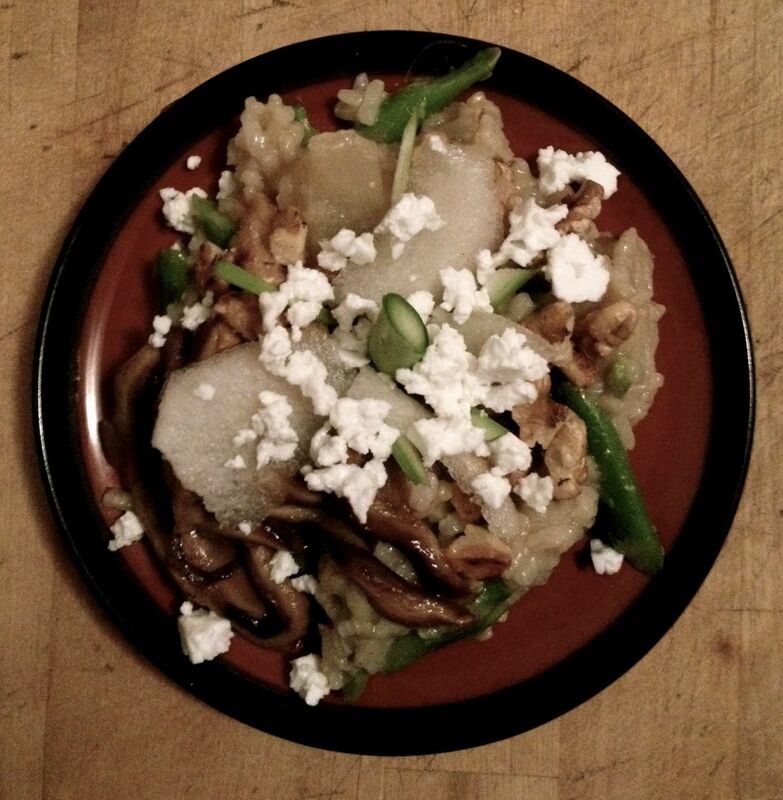 Plate risotto and top with shiitake, walnuts, feta, and some freshly shaved asparagus and asian pear. Have a sweet tooth but want to fulfill the craving with something healthy, kosher, and organic? 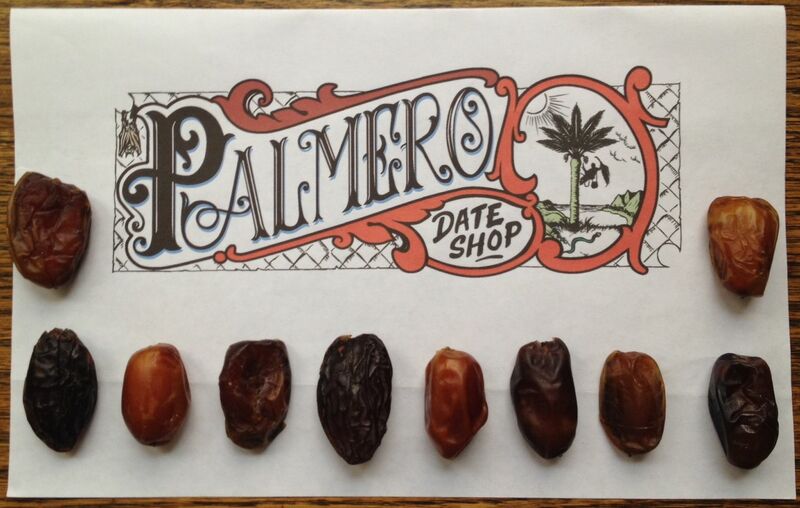 Stop by the Palmero Date Shop stall this Thursday to pick up some tasty and succulent dates! Ronald will guide you through his wide variety of dates for any sweet or savory craving. His Jumbo Medjool dates are the best for snacking, as they embody the true unique flavor of perfectly ripe Medjool dates from Bard Valley California. Also highly recommended are his unique, dainty, and incredibly sweet Khadrawy dates that melt in the mouth — a delectable treat! This week Palmero Date Shop will be introducing new Varietal Date Paste balls that are great for making Vegan Date Shakes, as featured in the recipe below. 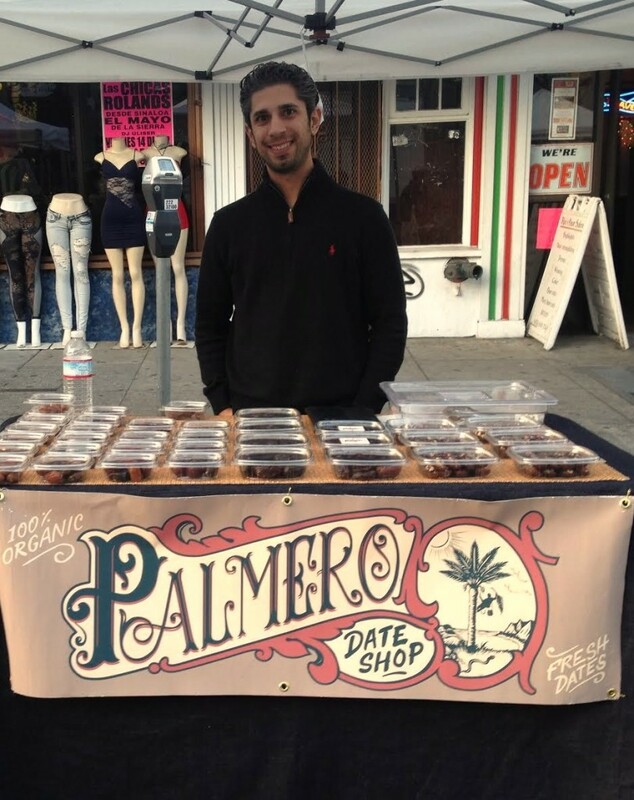 Palmero Date Shop is no ordinary date vendor. They provide traceability for all of their five varieties of dates produced on a small farm in Bard, California; 100% Organic, Kosher. They follow strict food safety procedures to ensure that their smooth pillows of natural sugar are dispersed responsibly and ethically to a wide range of communities in the San Francisco Bay Area and New York City. Not only do Palmero Dates track and document every batch of their mouthwatering dates, they work hard to educate the public about the unique date growing region in Bard, California. One of their goals is to create a larger demand for varietal dates so growers will be encouraged to plant new date palm cultivars and ultimately expand the selection of dates for farmers market consumers in the future. For this weeks recipe, Ronald recommends their new Varietal Date Paste pack for a healthy, sweet, protein-packed Palmero Date Shake. To add to this tasty smoothie, stop by the Winters Fruit Tree stall to pick up some Raw Nonpareil Almonds! 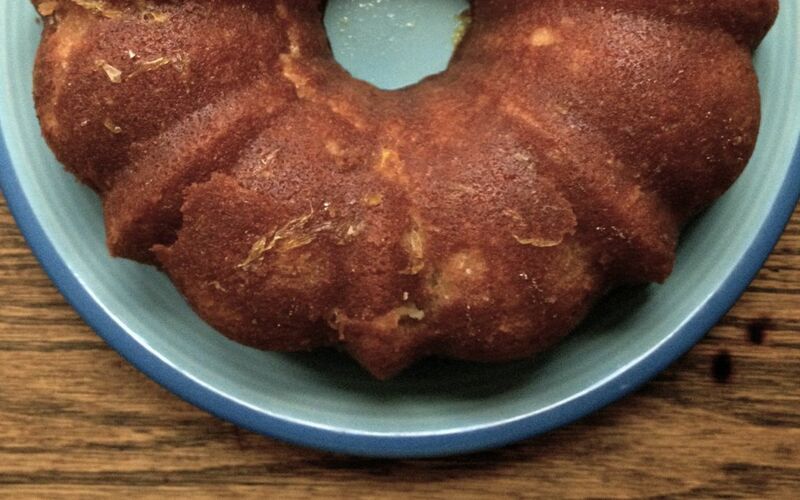 Check out the full recipe after the jump!